Yesterday I was heartened to see the news that the Cleveland Indians Major League Baseball team is going to stop using its blatantly racist caricature of an American Indian, “Chief Wahoo,” on its uniforms starting the 2019 season. The leering cartoon character is so obnoxious that my wife Erin has included it for years in a workshop she gives on racist icons in American culture from Aunt Jemima to the Frito Bandito. But this being American in 2018, the philosophy of yin and yang means that for this bit of good news (the chief will be benched from uniforms but not from team merchandise) there is a balancing blast of bad news. That came at practically the same time, when I saw a post on Facebook sharing a godawful item from Walmart.com, a “Kids China Boy Costume,” complete with a photo of a young white boy dressed in an inappropriate, culturally appropriate and inexcusably phony polyester suit with baggy pants, a Mandarin-collared shirt with Chinese-style knot buttons, and a matching hat with an attached queue of braided hair (which is sold separately to “improve your costume”). There’s been lively discussion about the item, which is currently sold out, by the way, on my Facebook page. An old friend from school pointed out the “hat sold separately” line, which actually seems hilarious to me. Why the hell would someone just buy the hat? Someone else who speaks Chinese (sorry, Nicholas, I forget if you speak Mandarin or Cantonese, or both) pointed out the Chinese characters on the shirt are gibberish. Another pointed out that upon close inspection, you can see that the kid has mascara to make his eyes look slanted! Most people who saw it on Facebook think it’s awful, but one friend who I respect asked why the costume made me angry. She said when she was young she loved learning about other countries and their cultures, and studied how people dress around the world. She had dolls in native costumes — hopefully they were accurate and culturally respectful and educational. I know, or hope, the child in the catalog photo is innocent. I doubt he understands anything about what he’s wearing. Hopefully, anyway, he didn’t go around saying “Ching-Chong!” while posing for the photo shoot. But the child isn’t buying this stuff, it’s parents buying it for children. And by doing that, parents perpetuate stereotypes of what Asians are like — it keeps Asian Americans as permanent foreigners, always The Other. Something exotic. Not really American. Ever. On top of all that, this kid’s eyes painted to look slanty just makes me want to throw up…. I don’t think this kid is racist, or his parents, or anyone who had a childhood fascination for other cultures. That fascination is great, I wish more people had that and learned about the world. But I doubt any kids and their parents who think this costume is cool is curious about world cultures. They’re just on an ignorant path. They’re not looking for knowledge about China or Chinese history. They’re using the most shallow and fake surface elements to convey “Chineseness.” If it were easy to put on yellow makeup (imagine a costume where a kid would put on blackface to appear African American), I bet they’d do that in a second. Now, going to that step would make them flatout racist. Walmart, go through your online vendors and clean out all the crap. It was just a few months ago when a Walmart vendor sold framed photos of Japanese American concentration camps as perfect wall decor, after all. NOTE: While I’m at it, let’s not let Amazon off the hook. Search for “China Boy Costume” on Amazon.com and you won’t find the Walmart special (oddly, the search results shows lots of fake glasses — what’s with that???). 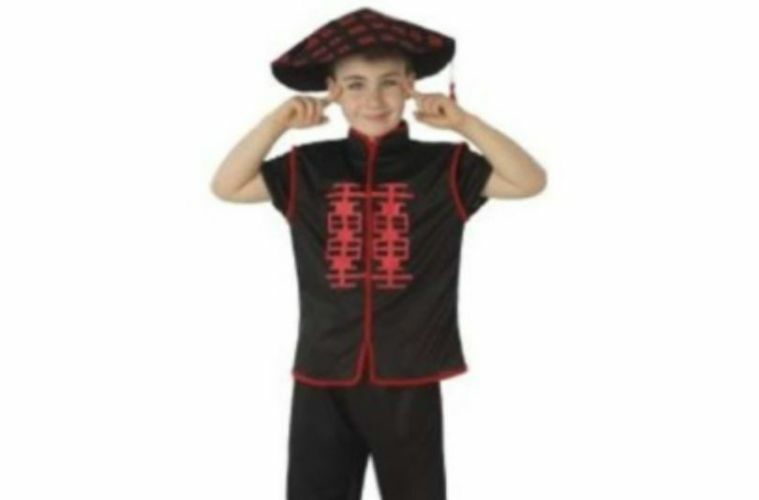 But Amazon in the UK is under fire for a vendor selling “Asian” costumes with white kids wearing them while they pull their eyes back in a slant — another stupid unoriginal trick that was shown to me many times growing up. Come on, world, GROW UP! UPDATE: The costume (and the JA concentration camp photos from before) were sold by third-party vendors through Walmart.com. Walmart has removed the costume, along with other offensive items they found when they did a review, and is reworking their vendor rules to prevent similar incidents.